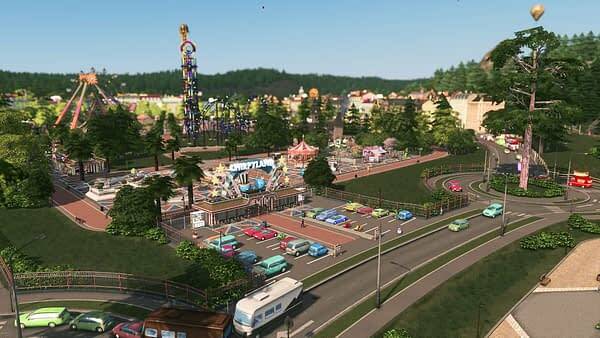 Paradox Interactive and Colossal Order have released the playful Parklife expansion for Cities: Skylines on PC. The best-selling city-builder now offers vibrant new parks, playgrounds, zoos, and green spaces. Because the biggest thing missing from Cities was your ability to enjoy some RollerCoaster Tycoon style park simulation. The game now has a new park area tool, five new maps, a ton of new assets and level-up features that increase your park’s property values. So you can go ahead and add Disneyland Tokyo or the London Eye to your city maps, or decide that the best public transportation for your city is actually a roller coaster. Its really up to you. Additionally, Cities is also getting a new radio station today: Country Road Radio, with 16 new songs from Appalachian Folk, Bluegrass/Honky Tonk, Nashville Modern Country and Unplugged country. In addition to the paid expansion, Cities: Skylines will also get a free PC update which brings a new tourism panel, trees that reduce noise pollution, a camera mode upgrade, new tourist models, and new modding features, including submeshmodding and an improved camera system so users can control the camera with scripts. You can find out more about the new DLC on the official website. You can check out the new Parklife trailer below, though there is also a 3D Parklife trailer tour that might also be of interest. You can find the 3D trailer here.